Meet our 11th #WeCyberToo Talent Spotlight, Sakinah Tanzil! She is a Senior Information Security Professional and life-long Detroiter who was educated in the Detroit Public School System. Her career was inspired by writing a paper about Bill Gates and learning about the national Y2K problem with computers in the late 1990’s. It all started in the late 1990’s when I watched international news stories about the Y2K (Year 2000) issues with the potential changing of all computer calendar years to “00”. The fear was that this change would possibly shut down all information systems. I felt that this event was a call to action to go to college and learn all about computers in order to help our nation. When I started college to learn about the industry, I do not recall seeing females who looked like me in my classes. I also struggled to learn the complex material and programming code without a home computer because I could not afford one, so I stayed late at the school lab to get my homework done. I was not able to find any role models or mentors at that time who could relate to my struggles, but I found the faith and determination to continue this path despite the odds. I graduated with Honors with an Associate of Science in Computer Information Systems in 1999! In my English class I was asked by my instructor to pick a person to write a paper and develop a presentation about. I choose to write on Microsoft founder Bill Gates for my assignment. I learned so much about his story, accomplishments, and how his software was used to help with space exploration, healthcare outcomes, business productivity and so much more. As a result of my findings, it gave me the push and inspiration to recognize I was on the right path and pursuing the right industry. A reader of Danyetta’s profile suggested asking future interviewees to share failures because those have a bigger impact than just “feel good” stories. Do you have a failure that you would like to share? Once I graduated in 1999, I was ready to help my country and thought that employers would welcome me with open arms since the Y2K problem was a looming threat. I started applying for jobs and all the businesses were telling me that I did not have enough education or experience to get the positions . That devastated me because I thought the need to hire was so great. As a result of that rejection, I decided to stop pursuing this career path and moved on. I regretted that decision and wish I would have been more persistent. If I had not given up on the field back then, I probably could have gained a lot more experience over the years. I stayed away from the industry for almost 10 years. During that time, the industry had changed drastically and I had to re-learn everything all over again. When I left the industry I became a flight attendant, medical assistant, entrepreneur, and real estate broker. However, these roles were not my true calling. I did learn a lot of transferable skills from all these industries though. In the end, the experiences helped me discover new skills that continue to benefit me today. My advice to future professionals is to use every experience as a learning opportunity. Stay in school and learn as much as you can about STEAM (Science, Technology, Engineering, Art, and Mathematics) because employers, nonprofits, and other businesses will require that skill set. I would recommend what I was told to strive for, and that to was study and prepare to take the Certified Information Security Auditor (CISA) and the Certified Information System Security Professional (CISSP). These credentials give you the opportunity to understand the strategic and holistic concepts of information security from a enterprise risk management perspective. I am bound by confidentiality agreements, so I am limited to what I can share. As a Senior Information Security Professional, I help to develop and support the enterprise security policies, standards, business processes, and guidelines according to best practices, industry standards, legal and regulatory requirements. My role is also responsible for educating staff on safeguarding my organization’s brand and reputation by ensuring the confidentiality, integrity, and availability of the data we are entrusted to protect. I became a CISSP because I believe that this is the best internationally recognized certification in the industry. It sets security professionals apart from all other candidates that do not have it. It communicates to employers that you can have the industry’s common body of knowledge and professional code of ethics that you will bring to their business. Additionally, as a minority woman, having this certification puts you in a elite group. I would recommend reading all the CISSP exam preparation guides, purchasing a test preparation exam tool, taking a CISSP boot camp, taking exam notes, and recording key takeaways to listen during the preparation period. This is what worked for me. The accomplishments I am most proud of are graduated with all A’s for both of my Master Degrees and received the Computer Information System Graduate Award! I worked as a subcontractor for the government on the NICE Framework which sets the knowledge, skills, and abilities for IT Professional. I also published a paper on Academia.edu called: Cyberterrorism and Cybercrime that has been read by people all around the world. I am proud that I helped President Obama create the healthcare essential benefits for the Affordable Care Act. I am happy and proud to have the privilege to work on a state level to advise other healthcare organizations about security threats in our industry. Editor’s note: this phenomenal woman worked on historic healthcare legislation with our favorite POTUS. How cool is that? I want future professional and young people to know it is never to late to start over and your background, financial status, community, or past do not have to dictate your future. Faith, determination, dedication, persistence and the willingness to learn new things can take you anywhere your heart desires. Thank you so much for taking the time to share your experience and wisdom! How would you like readers to contact you? Sakinah was educated at Henry Ford Community College where she obtained her Associates Degree in Computer Information Systems in 1999. She has worked as a Flight Attendant, Entrepreneur, and Real Estate Broker. She later obtained a Bachelor’s Degree in Information Technology and Security at Baker College in 2010. Sakinah has worked on President Obama’s working group that developed essential healthcare benefits in the Affordable Care Act also known as Obamacare which became national law in 2010. 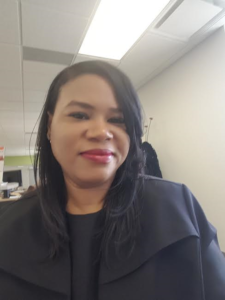 Her Cyber Security career includes working at a Cloud Computing Company, 2 Michigan Health Insurance Plans, and presently working as a Senior Information Security Process Analyst at Nationally- Recognized Healthcare System. Her passion is learning new things, educational achievement, cyber security, and healthcare for all. Therefore, she continued her educational track by obtaining a Master of Science in Information Assurance in 2012 and Master of Science in Software Management in 2014 from the University of Detroit Mercy. She also volunteered for cyber security and healthcare related causes. 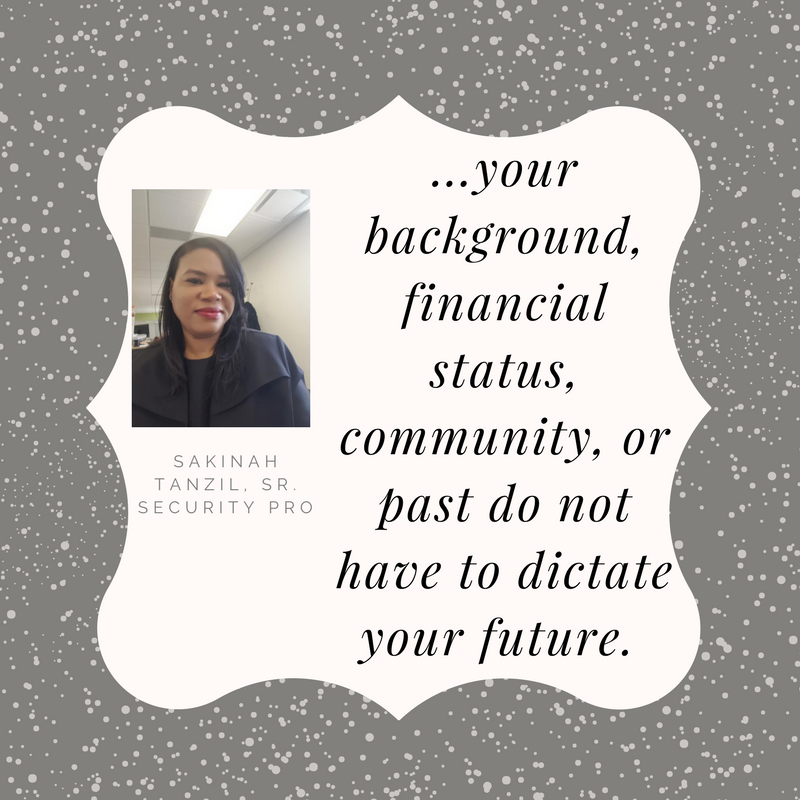 Sakinah currently volunteers for the Michigan Healthcare Cyber Security Council (MiHCC) where she Co-Chairs the Training and Awareness Committee. Her goal is to one day work on giving back to her community by working for a non-profit organization that helps educate, train, and mentor minority girls and boys to become future Cyber Professionals.